In 2008, the Write Place published In Search of a Better Way: The Lives and Legacies of Gary and Matilda Vermeer in celebration of Vermeer Corporation’s sixtieth anniversary. Now, almost 10 years later, Gary and Matilda’s daughter and former Vermeer CEO Mary Andringa has partnered with the Write Place to publish a companion history: Remembering Dad: Gary Vermeer’s Daughter Recalls His Life and Legacy. 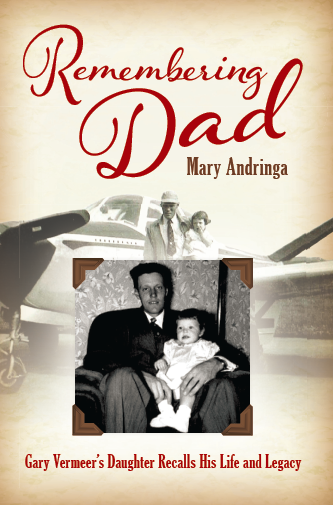 In Remembering Dad, Andringa weaves these and other stories together with her own memories to paint a warm and vivid portrait of a loving father, an exacting engineer, a dedicated servant leader, a man of faith, and much more. “He was a complicated man,” said Andringa. “I know a book can never do justice to a life, and I keep thinking of other stories and pictures I could have included. But there comes a time when you have to declare a manuscript complete! Remembering Dad: Gary Vermeer’s Daughter Recalls His Life and Legacy is available for purchase at Amazon and BarnesandNoble.com. Mary Andringa began her career as an elementary school teacher. She received a Bachelor of Arts from Calvin College in Grand Rapids, Mich., and taught in both Iowa City and Omaha. In 1982, Andringa began working in market research at Vermeer Corporation. She has filled a variety of roles at Vermeer, including president, COO, and co-CEO. She was named president and sole CEO in 2009, a position she held until 2015 when she transitioned into the role of Chair of the Board. She has been married to her husband, Dale, for over 45 years. They have two children and six grandchildren. Remembering Dad is her first book.